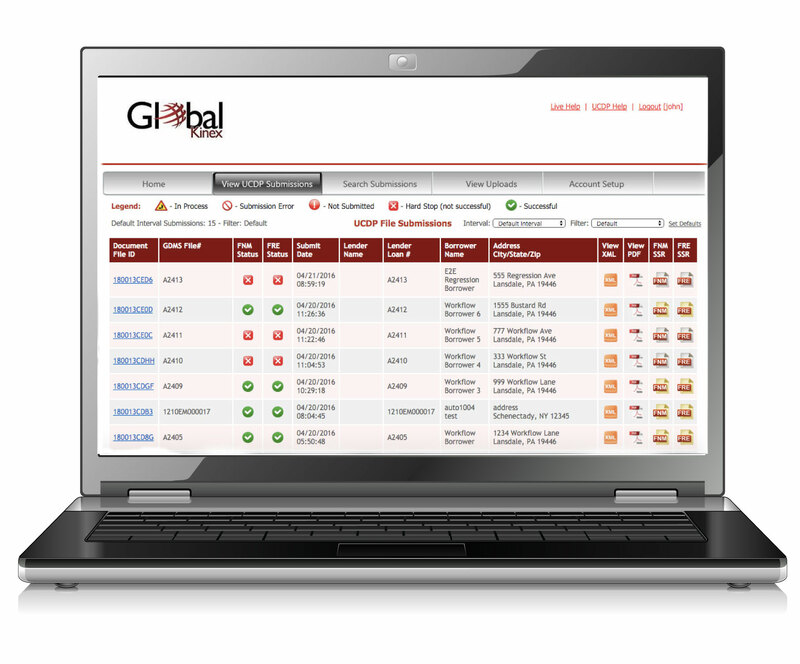 Global Kinex provides a seamless integration to both the GSEs' UCDP® and FHA’s EAD portal. Unlike other industry software, Global Kinex can be used by any lender or AMC regardless of what software they or their appraisers are using. Global Kinex manages all hard-stop resolution and provides storage and rapid access to all processed appraisals in the PDF, XML, and SSR formats. Global Kinex can be implemented as a stand-alone solution or in conjunction with our valuation management platform, eTrac Enterprise. Global Kinex validates and extracts the Base 64-encoded PDF within the Mismo XML file, ensuring an identical matching pair. This process allows appraisers to submit a single file for processing multiple workflows. Underwriters can review the PDF version of the report, while the XML file can be processed programmatically by the system. The conversion process allows PDF appraisals to be processed by other lines of business, such as correspondent, where the original Mismo XML may be unavailable. Global Kinex uses a proprietary process to convert first-generation PDF appraisal reports for UAD and non-UAD forms to Mismo XML. Appraisals processed by Global Kinex undergo a thorough series of checks, including a GSE rules set and a UAD compliance check. The UAD compliance check may result in errors that require appraisals to be corrected by the appraiser and re-submitted. Global Kinex supports multiple methods for delivering appraisals to the UCDP. The Global Kinex portal allows individual reports to be submitted directly to the UCDP. Alternatively, Global Kinex's web services architecture provides organizations with a method to integrate UCDP delivery into their commercial or proprietary applications. Post-delivery, Global Kinex’s portal provides a tool to track submissions, download Submission Summary Reports (SSRs), archive reports, resolve hard-stops, and resubmit reports.